Happy March, American Masters fans! 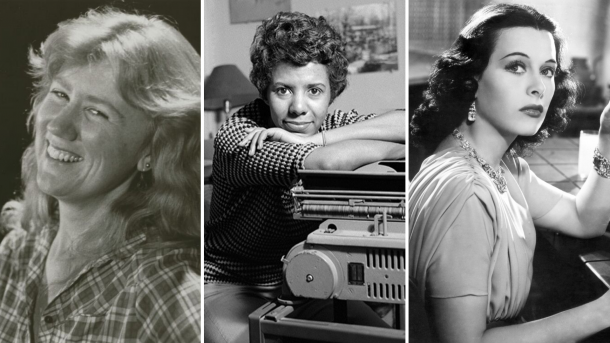 This month, American Masters is proud to present documentaries about pioneering women Holly Near (premieres tonight, March 1 at 9 p.m. on PBS, check local listings, and streams beginning March 2), Hedy Lamarr, Lorraine Hansberry and Julia Child, as well as The Women’s List, in honor of Women’s History Month. Enjoy these films, now available to stream for a limited time, via pbs.org/americanmasters and PBS apps. An outspoken political activist and singer-songwriter, Holly Near’s music and life story illustrate how song can have the power to send a clarion call and influence the course of social justice – from the lesbian and women’s movements to anti-war efforts and the fight to give South American women a voice. American Masters – Holly Near: Singing for Our Lives explores how the activist-artist provided an inspiring soundtrack to nearly a half-century of global and local struggles for equality and change. Directed by four-time Emmy Award-winner Jim Brown (American Masters — The Highwaymen: Friends Til The End, American Masters – Pete Seeger: The Power of Song), the documentary premieres nationwide Friday, March 1 at 9 p.m. on PBS (check local listings) in honor of Women’s History Month and will be available to stream the following day via pbs.org/americanmasters and PBS apps. Hollywood star Hedy Lamarr (Ziegfeld Girl, Samson and Delilah) was known as the world’s most beautiful woman – Snow White and Cat Woman were both based on her iconic look. However, her arresting appearance and glamorous life stood in the way of her being given the credit she deserved as an ingenious inventor whose pioneering work helped revolutionize modern communication. An Austrian Jewish emigrant who invented a covert communication system to try to help defeat the Nazis, Lamarr was ignored and told to sell kisses for war bonds instead. It was only toward the very end of her life that tech pioneers discovered that it was her concept that is now used as the basis for secure WiFi, GPS and Bluetooth technologies. Celebrate the life and legacy of Julia Child (1912-2004), fondly remembered for introducing French cuisine to American home cooks through her television series – beginning with WGBH’s The French Chef in 1963 – and books. The film tells two love stories: one between Julia and Paul Child, the other between Julia and French food. Originally broadcast in August 2004, the film features previously unseen photos, including several from Paul Child’s personal archive, granted exclusively to the film’s producers. Child was a pioneer in public television’s long tradition of cooking programs, revolutionizing the way America cooks, eats and thinks about food. Directed by Marilyn Mellowes. Meet 15 women who have created and defined contemporary American culture in this chapter of filmmaker/photographer Timothy Greenfield-Sanders’ List documentary series (American Masters: The Boomer List, The Black List, The Latino List, The Out List), including artist Laurie Anderson, artist, comedian Margaret Cho, singer-songwriter Alicia Keys, actor Rosie Perez and writer-producer Shonda Rhimes. American Masters: The Women’s List focuses on these individuals’ exceptional achievements, struggles and identities. All trailblazers in their respective fields, these women share their experiences struggling against discrimination and overcoming challenges to make their voices heard and their influence felt.